In 1953 sweet rationing finally ended. Kids all over the country scraped together every last farthing and dashed to the corner shop for a taste of pontefract cakes, penny sherbets, plush nuggets, raspberry drops and dolly mixtures. There was nothing more exciting than wall-to-wall jars of sugary lovelies, calling to us! All things sweet became our passion. The sheer luxury of a whole Mars bar to ourselves; the delight of a jubbly at the pictures or candy floss by the sea… no wonder we look back on these first sweet loves with such nostalgia. See how many of your sweet memories made it into our mixed bag. Let’s start by remembering the generous souls who handed coupons in at shops so they could be given to us kids. 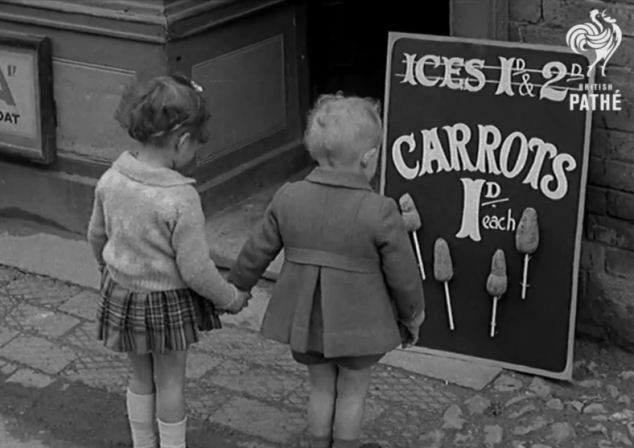 Thanks to them we occasionally got a proper sweet instead of the popular wartime alternative, iced carrots. Imagine giving those to the grandchildren today! The local sweet shop was the most magical place. So many jars, so much choice… how far would 6d stretch? Window-shopping was a serious business. We’d stand on tippy toes to catch a glimpse of the ha’penny chews and sweet cigarettes on top of the high wooden countertop. If we bought a packet of ‘fags’, we’d pretend to smoke them all the way home. Some of us may remember when a 2oz chocolate bar at Christmas was as good as it got. Once sugar was back, the nation went mad for chocolate and some of the younger kids had their first real taste of its loveliness. Hopefully we had enough pennies for both the ticket and some sweets from Woolies or the usherette between the film and cartoon. Blackjacks, Fruit Salads, Flying Saucers, Shrimps, Gobstoppers and Spanish Gold got us through many a cliffhanger. No trip to the seaside was complete without a stick of rock or a huge ball of candy floss. Even today, the smell of hot sugar triggers thoughts of donkey rides, dad paddling in his jacket and soggy, knitted bathing suits. If you enjoyed these sweet memories, you might also enjoy our look back at holidays after the war, school days and the most dramatic weather of our lifetime. Mobile phones were big but the hair was bigger.